In the article How to Choose the Best Folding Knife, we determined the criteria that you should consider when looking for the best folding knife. If you are new to buying knives and not certain what to look for, I strongly recommend reading the article so that you can make an informed decision when looking for the best folding knife to fit your needs. Which Knife Is the Top Rated Folding Knife? Please support us by clicking on one the share buttons below to reveal the top rated knife. What are the Best Folding Knives? Now that we have determined what to look for when choosing the best folding knife, we can have a look at the top-rated folding knives currently available. Using the comments and ratings from hundreds of users, we have put together a list of what we think are some of the best folding knives available. Each has different characteristics and can be considered the best folding knife, however choosing which is the best folding knife depends on your needs and personal taste. If you want a simple, yet high-quality knife, this is the best folding knife for you. The Buck Knives Hunter folding knife is a simple pocket knife for everyday use and outdoor. The single stainless steel blade is 3 3/4 inches long, making it fitting for fans of medium-sized knives. The implementation of stainless steel allows the blade to last for years with everyday wear and tear and even rough conditions outdoors. The blade for this particular knife is a straight-edge which is great for common uses such as self-defense and everyday cutting purposes. The handle is made up of a combination of wood and brass to make for a sleek design and a comfortable feeling while holding it. For a point, we have the popular clip-point design. This allows for great precision and control as well as great slicing and piercing ability. 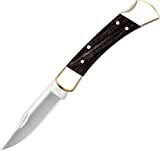 This knife has many of the characteristics the best folding knife should have, however on the negative side the handle is noted as being somewhat big and weighty, making it slightly annoying to carry around on an everyday basis and wield. The bulkiness and weight also make it a poor choice for a pocket knife, but the knife does come with its sheath to make up for it. Since the handle is made of brass and smoothed wood, it’s also not very easy to grip. This could be a hindrance in self-defense situations, and it could be a safety issue when using the knife for rough cuts or prying. The stainless steel blade is durable, but it will dull fairly quickly. This is especially true for people who wish to take advantage of the accuracy of the clip point for use in carving or anyone using the knife for hunting purposes. The straight-edge blade will be useful for many purposes both in everyday occurrences and outdoor use, but the lack of a sawing ability makes it less useful for certain survival purposes and cutting through particularly tough materials. This is not necessarily the best folding knife for your needs if you are looking for a single blade folding knife, as this is more of a knife with various blades and functions. 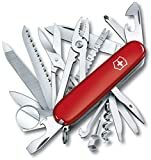 However, if you’re looking for variety in your folding knife, look no further than the Victorinox SwissChamp Swiss Army knife. This knife is a very popular choice for fans of multi-tool knives with the inclusion of 33 different tools to choose from such as two knives with one small knife and one larger knife, a regular screwdriver, a Phillips head screwdriver, a can opener, pliers, wire-cutters, two saws, additional smaller screwdrivers, a wire-stripper, scissors and much more. All of the tools, barring the magnifying glass, and the general construction of the knife are made of stainless steel to provide the user with durability and strength to deal with everyday use and frequent outdoor use. While the entirety of the knife’s construction is made from stainless steel, the outer shell comes in either thick plastic or wood. You can also select colors such as black, red and blue for the plastic covers. As for the knives themselves, they’re fairly standard blades that come with most multi-tool knives. They’re both drop-point blades with straight-edges, but the inclusion of two saws in the knife negate the disadvantages of not having a serrated blade. The larger blade of the two is a little under three inches long, but it’s not particularly wide enough to do many big jobs. The stainless steel construction also means that the knives will dull fairly easily, and this may occur even more frequently if the knives tend to rub up against other tools while closing. Opening the knives can also be difficult for people with short fingernails as the opening to grab the knife isn’t very large. There’s also no lock to prevent the knives from accidentally closing, which could present a safety hazard. While variety is a great thing, this knife may have too many options for the average user. Some options such as the fish scaler, toothpick, and magnifying glass may be seen as frivolous or useless to some users, and overloading a multi-tool knife with too many options can be seen as annoying and complicated. The Kershaw Ken Onion Blur folding knife is a tactical folding knife meant for everything from everyday purposes to combat. The single stainless steel blade comes in either partially serrated or straight-edge design to match the user’s preferences, and each knife sports a drop-point for precise piercing and cutting ability. The blade measures out at 3 3/8 inches to make it a comfortable fit for fans of medium-sized knives. The handle of the knife is made of anodized aluminum to withstand rough use in situations such as hunting, camping, survival situations and combat, and it comes with a textured grip for extra gripping power. A key characteristic the best folding knife should have is safety. This particular knife features a SpeedSafe assisted-opening mechanism to make for a quick and easy opening while also preventing accidental openings. While this knife may seem to have everything the best tactical knife should have, there are some drawbacks. Though stainless steel does tend to dull quickly anyway, these particular knives seem to dull even faster than normal stainless steel knives. The blade also doesn’t seem to stand up well to rough use such as prying, and the serrated teeth seem to have a habit of breaking or bending. There’s also a safety issue with the liner lock as many users have complained that the lock fails and jams extremely easily, which could lead to the knife accidentally closing your hand during use. Finally, the textured grip is of fairly good quality, but it can still get slightly slippery when wet. This knife is a contender to win the title as a best folding knife. 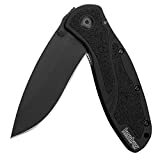 Kershaw’s Blur Knife focuses on ease of use with a SpeedSafe assisted-opening mechanism to make opening quick and easy and a Trac-Tec textured grip meant to provide a secure grip even in rough or wet conditions. The blade itself is 3 3/8 inches of stainless steel with the option of getting either a straight-edge or a partially serrated edge depending on your preferences. Both versions come with a drop-point edge for great precision and cutting power. The SpeedSafe opening mechanism is great for fast and easy one-handed opening in survival or self-defense situation. It also helps prevent accidental openings to avoid safety issues. It also includes a liner lock to prevent accidental closing during use for even more safety. The handle is made from anodized aluminum to provide the knife with plenty of durability and strength in rough use, and the grip is textured to provide better grip. Textured grips have a reputation for becoming slippery when wet, but the Trac-Tec textured grip seems to hold a much better grip in wet conditions than traditional textured grips. Even the best folding knife has some downsides. There really only seems to be one downside to this knife and that’s the initial sharpness. These knives tend to come out of the package dull, which means they may need an immediate sharpening before using it or carrying it around. While regular sharpening isn’t a complete surprise for stainless steel blades, a good knife should always be sharp right out of the package for instant use. This issue is made even more problematic since the S30V steel used in the blade is fairly difficult to sharpen since it’s made to be stronger and more durable than other types of stainless steel. However, this particular downside can be taken with a grain of salt since you are getting a stronger and tougher blade in exchange for some extra time and patience with a sharpener. Did You Find the Best Folding Knife for Your Needs? Finding the best folding knife depends on your needs as well as your taste. However, the knives reviewed above are all good quality knives that will give you value for your money. What are your thoughts? Do you have another opinion of what is the best folding knife? 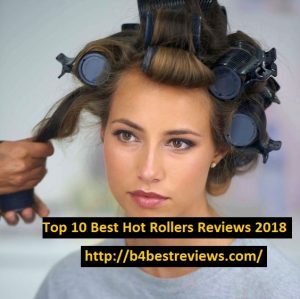 If you do please, share your comments with the rest of us in the comments section below. We hope this article helps you to find the best folding knife for your needs.